With our Mothers Day brunch and dinner this past weekend, and a month or two worth of other treats and snacks that I've made from other blogs, I thought it was time for another recipe round up to share some of kitchen successes I've had lately! For my birthday last month, my sister Natalie got me a couple of new cookbooks that she knew would be exactly my style - the Oh She Glows Cookbook by Angela Liddon (mine is the Canadian cover), and Straight from the Earth by mother-daughter duo Myra and Marea Goodman. I knew I wanted my own copy of the Oh She Glows book after seeing so many other bloggers rave about the recipes, and I know from my own experience that Angela's recipes are not only healthy but they always turn out well! I've only made one recipe from the book so far - the 15 minute creamy avocado pasta (one that I've made from her blog a few times before as well) and if it's any indication of the quality of the other recipes in the book, then I definitely can't wait to try more! Another birthday treat that I haven't mentioned on my blog yet was the one I made for myself! Instead of making a cake this year, I opted for miniature "cheesecakes" that I could bring in to the office to share with people. I based the recipe off of Chocolate Covered Katie's greek yogurt cheesecake, except I used a regular (non-vegan) lemon greek yogurt and reduced the sweetener a bit. Instead of making one large cake, I crumbled the graham cracker base into muffin liners and made individual cups that I baked for about 20-25 minutes. 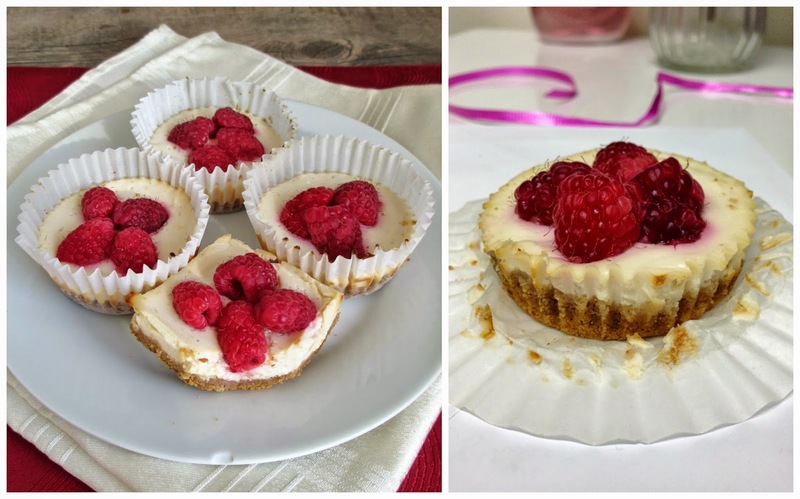 The texture was definitely different than a regular cheesecake, but it got better after one or two days in the fridge and I loved how creamy they were! Another recipe from Chocolate Covered Katie's blog that I tried recently was her one-minute coffee cake in a mug (pictured below). I left out the topping and added cinnamon to the batter instead, and I also baked mine in a wider ramekin so it was a bit flatter, but it came out perfectly! I thought it did taste like coffee cake and had a nice texture - hard to believe you can make it so easily just in the microwave! Topped with some yogurt and a sprinkle of granola, this made a nice light breakfast along with a smoothie. I've also been loving the recipes posted by Lauren on her blog Oatmeal with a Fork - she always has new ideas for healthy no-bake treats that I keep bookmarking! I tried her double layer chocolate cookie bars recently and loved the combination of oat-based cookie dough on top with a cocoa and date layer on the bottom. I made a few changes based on the ingredients I had on hand, including adding some PB2 to the top layer for a bit of a peanut butter flavour which worked well. Another healthy treat I made recently was this vegan banana bread chocolate chip snack cake from Ambitious Kitchen. I loved the flavour that the oat flour added (although I substituted half of the oat flour with whole wheat flour), and I thought they had the perfect amount of banana taste. These were nice and light with a touch of richness from the chocolate chips. I would definitely make these again! I actually made the banana cake for a daytrip with my family that we organized for my dad's birthday. Along with the cake, I also made these no-bake fig newtons because my dad loves figs! I followed this recipe for date newtons by the Pancake Princess, adapted from the blog Rawified (who also made a fig version). The outside is made from ground up nuts, oats, and flax, and the inside is a paste made from dried black mission figs. They were soft and chewy, and pretty rich so you only need a small piece for a healthy snack! Finally, I wanted to share a few of the recipes that I tried this past weekend for Mother's Day. 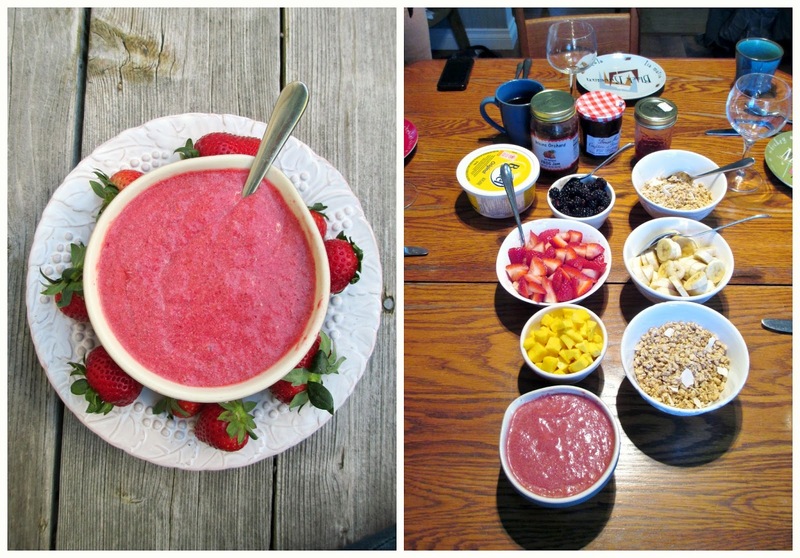 For brunch, my sisters and I got together to eat with our parents and we prepared a fun and interactive breakfast buffet! I set out a couple of kinds of yogurt with a variety of fruits and some granola so that everybody could make their own yogurt parfait, and my sister also made some amazing biscuits that we ate fresh out of the oven with different jams. My favourite part of the meal though was this no-cook strawberry lemon chia curd from Edible Perspective that I made the night before and let thicken in the fridge overnight (I used all black chia seeds so mine turned out a little darker). It was the perfect addition to both the yogurt parfaits and the biscuits! For dinner later on in the day, my sister made a strawberry goat cheese salad topped with chicken, and for a vegetarian option I decided to make some tofu to go with the salad. I followed this recipe for breaded tofu from Divine Healthy Food, making a couple of small changes to the marinade and sauteeing it rather than grilling. I've never made breaded tofu before but I loved how it turned out! I also made this strawberry focaccia with maple-balsamic caramelized onions and basil from Saveur to go with the meal. The crust came out a little crispier than I wanted, but I loved the topping combination and I thought the leftovers were even better the next day because the crust had softened up a bit. It was a great meal overall, complete with rhubarb and lemon custard tarts made by my sister for dessert! You can check out a more detailed post about our Mother's Day meals on my sister Natalie's blog Once Upon a Cutting Board. Hope you're all enjoying the Spring weather and hopefully I'll be back soon with a new recipe to share! I love all the healthy snacks of yours I got to try, especially the fig newtons! I wish I got to try those cookie bars - I'll have to make them for myself! Oh man everything in this posts looks so good- I am in love with the covers of those 2 books!